My Monday vases this week are full of flowers that a) I didn’t grow, b) I didn’t pay for, and c) I didn’t even pick. They’re all leftovers from our village Spring Show on Saturday. One of the perks of being on the gardeners’ association committee and helping to put on these shows is that you’re able to give a good home to any unwanted blooms that people leave behind. 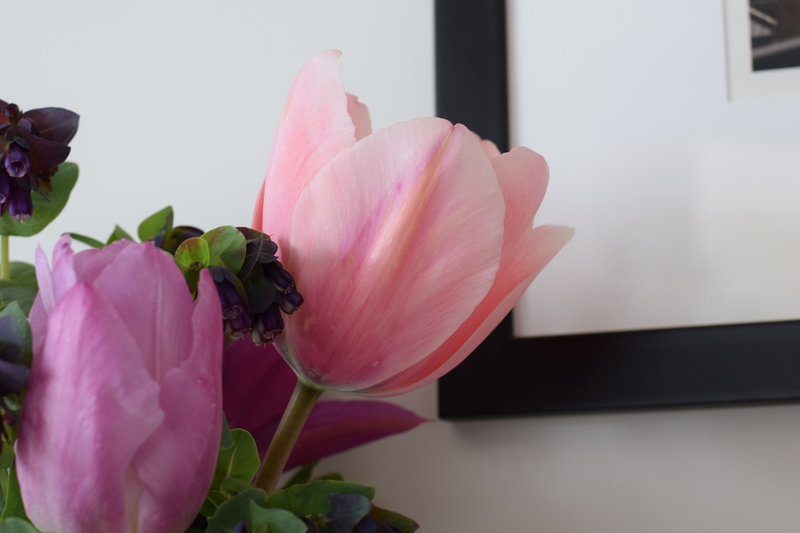 I’m completely in love with the large pale pink tulip – it is one of the three stems that won ‘Best Exhibit in the Horticultural Section’ and they drew much admiration on the day. The woman who entered them didn’t know the variety of tulip but I think it could be ‘Pink Impression’. 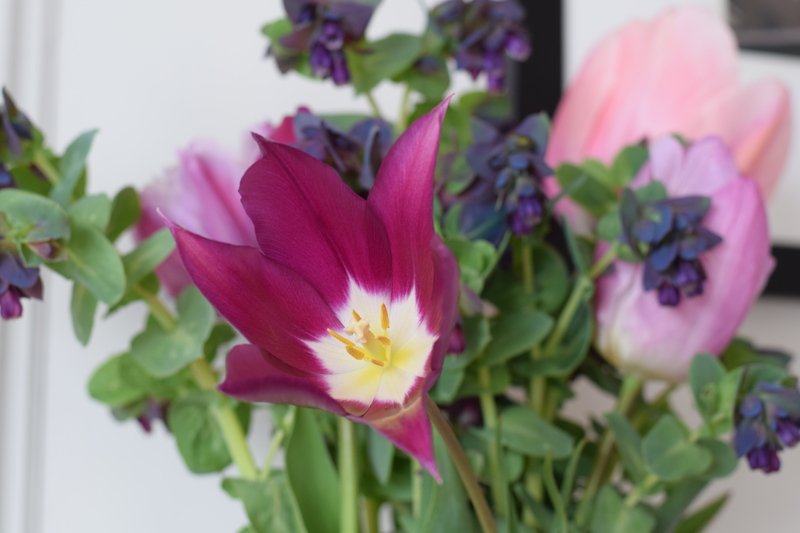 I also love the lily-flowered purple tulip which could be ‘Purple Dream’. 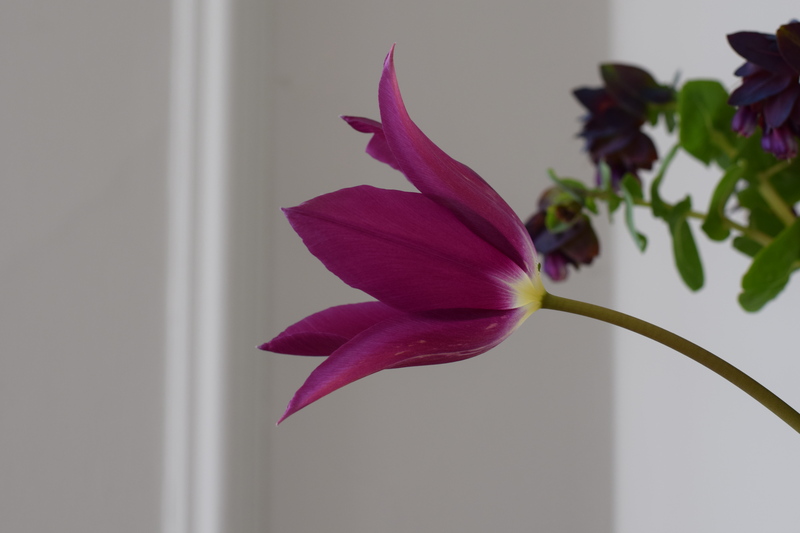 If anyone knows for sure which varieties these are, please leave a comment below – thank you. 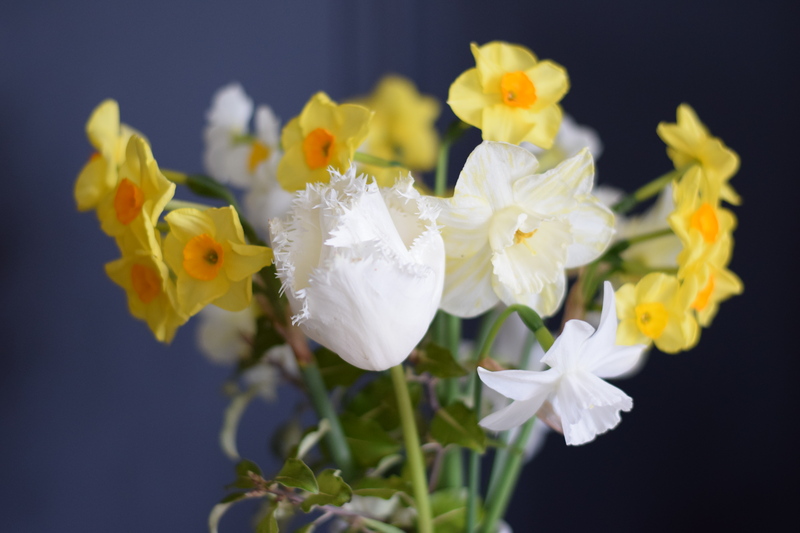 There was an impressive variety of beautiful Narcissi shown on Saturday and I was very lucky to bring a few home. 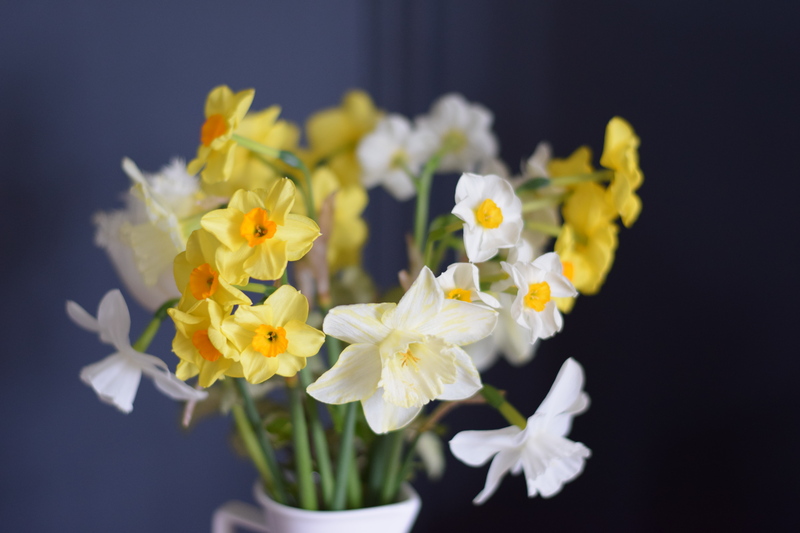 They’re filling the room where I sit typing with the most delicious daffodil scent and brightening up a dull corner. There’s a white frilly edged tulip nestled in there, too, which could be ‘Daytona’. Again, if anyone knows, please let me know. I particularly like the pale daffs and have made a note to plant more this autumn. Good white and pale varieties are ‘Thalia’, ‘Elka’ and ‘Pueblo’. There are several multi-headed and highly scented varieties too. 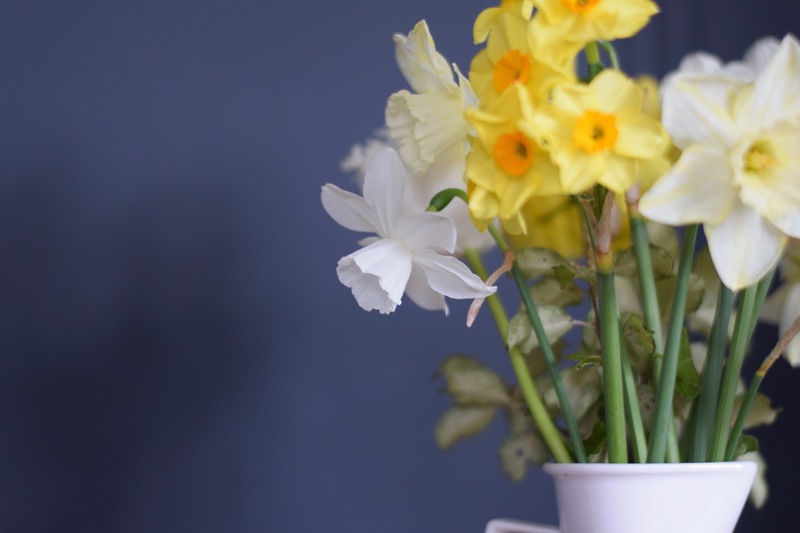 When you think of daffodils, it’s usually the traditional yellow version, but it’s amazing just how many varieties there are in all shades and combinations of yellow, cream and white, some with orange centres, tall and short, large flowers and small, single heads and multi-headed. As with most plants, there’s a variety to suit almost everyone. It’s the school Easter holidays and with my two school-aged children off on their travels, I started the week off by having a lie-in. Bliss. It’s been such a full-on time recently that I’ve decided to take my foot off the pedal a little for a few days, to do as little around the house and as much out in the garden as possible. I hope you have a thoroughly good week, whatever you have planned. As usual, I’m joining Cathy at Rambling in the Garden for her Monday vase gathering. Do visit her blog where you’ll also find links to other garden bloggers around the world. Tulips and daffodils, how lovely to be able to bring these beauties home and enjoy the lovely fragrance. I love these little late flowering narcissi. Enjoy your time in the garden. 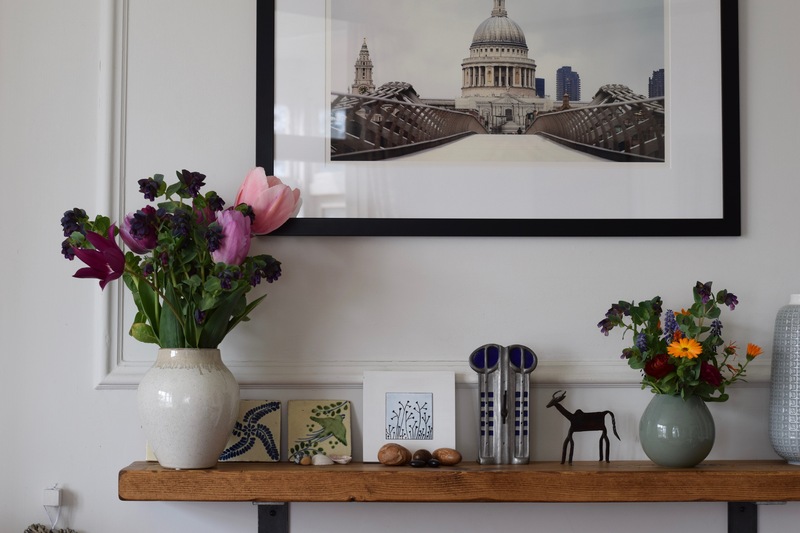 Taking your choice of the leftover blooms home is indeed a wonderful perk! Your week of downtime sounds great too. Enjoy your hours in the garden. I hope your weather fits your plans. Lovely blooms and what a super perk! 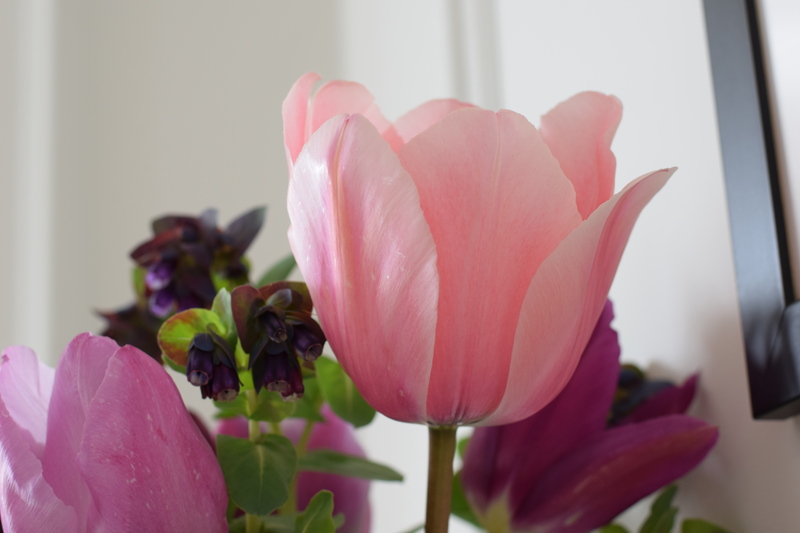 I’m afraid I don’t think that tulip is Pink Impression as I have it and it’s definitely darker – you can see it in my March End if Month view. And sorry, no clue what it is either, but would love to know too! Enjoy your week – I’m thinking of going crazy and taking Friday off as I’m off the island at the weekend and otherwise I’ll never get any gardening done – and at this time of year it’s so appealing! That’s a nice bonus and you’ve made such lovely groupings. I am noting down pale narcissus names for next year too. Lovely, lovely daffodils. On this week’s GW they were saying that there are more varieties than ever – and Monty particularly loves Thalia. My tulips are just starting to show flower heads in this cold Spring. The N. Actaea and poeticus were childhood flowers that I love to this day. I grew up in the 1960s an only child in a big house in the country with a classic Edwardian garden of orchards and herbaceous borders. When I went to primary school I knew more flowers than I did other children. Vivid early memories of standing waist deep in these narcissi. Enjoy your mini-break at home! Assembling them is enough to take credit for, isn’t it? For my articles, I regularly post pictures of redwoods that are centuries old, and a few that are many centuries old. Obviously, I didn’t plant them, and have never even pruned them. I agree about the white and pale-colored daffs, they are some of my favorites.